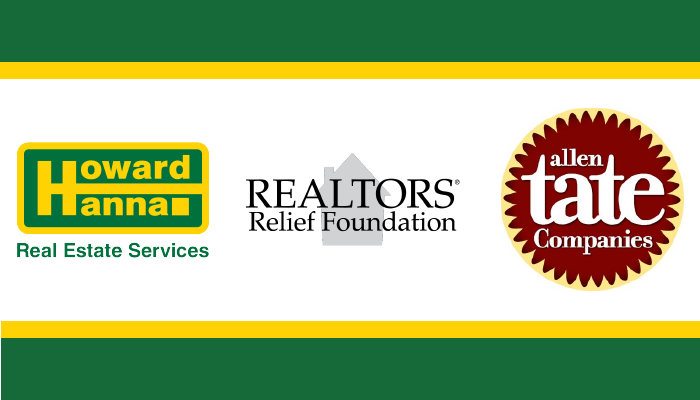 Pittsburgh, PA (September 26, 2018) – Real estate leaders Howard Hanna Real Estate Services and Allen Tate Companies announced a combined donation of $20,000 to the Realtors® Relief Foundation to help those in the Carolinas recently affected by Hurricane Florence. The donation was made September 20 at the Allen Tate Companies convention in Charlotte, immediately following the announcement that Allen Tate and Howard Hanna were joining forces to establish the largest privately owned, independent real estate firm in the country. “A few dollars from each real estate closing is donated to the Tate Foundation. I’m pleased to announce that we have donated $10,000 to Realtors® Relief Foundation on your behalf,” said Riley. Allen Tate’s donation was matched by Howard Hanna, for a combined donation of $20,000 from the new real estate partners. “Our thoughts and support go to the storm victims affected by catastrophic flooding and damage from Hurricane Florence,” said Howard Hanna Real Estate CEO Helen Hanna Casey. The National Association of Realtors first launched the Realtors Relief Foundation in the aftermath of 9/11, raising more than $8.4 million to provide assistance to surviving family members. Since then, more than $25 million has been raised for victims of disasters, including wildfires, tornadoes, floods, and hurricanes.